* ERROR * Design is not balanced; execution aborted. One of the assumptions in performing a Nested Gage analysis is that the data is balanced, meaning that it has an equal number of observations for all possible combinations of the factor levels. In a balanced Gage Study, each operator will measure the same number of parts the same number of times. When you have an unbalanced design, you have an unequal number of observations for the Operator/Part combinations. It looks like Operator F measured twice as many parts compared to any other operator. In some cases, this Gage Nested error can be quite useful. It can reveal to the user that he has an accidental missing measurement in his design or possibly a duplicate row that he needs to remove. However, in this caller's case, these were legitimate measurements that he wanted to analyze. How did we get around this? 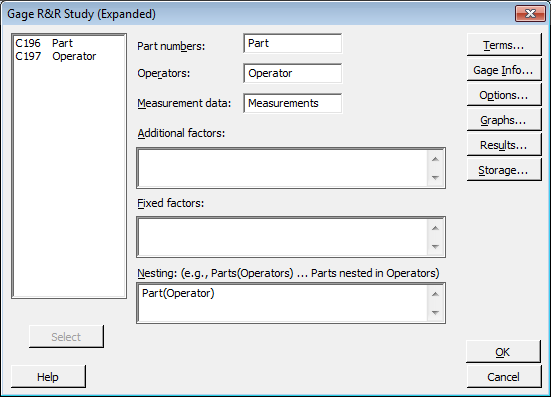 As you can see from the picture above, Gage Expanded allows for ‘Additional factors’ beyond Operator and Part. (All of the ‘Additional factors’ are assumed to be random factors unless specified in the ‘Fixed factors’ field as well.) Pretty powerful tool, right? For more information on our Gage R&R Expanded menu, click on the Help button shown in the picture above, or go to Help > Help > Stat Menu > Quality Tools > Gage R&R Expanded. I hope this helps you the next time you run a Gage analysis in Minitab!